Key 12” standard-design, multi-purpose general cargo ship; 12,701 grt; 15,806 dwt; 576 TEU. Main engine: 16-cylinder, four-stroke MaK 16M551AK of 10,500 bhp at 425 rpm. Speed: 18 knots. 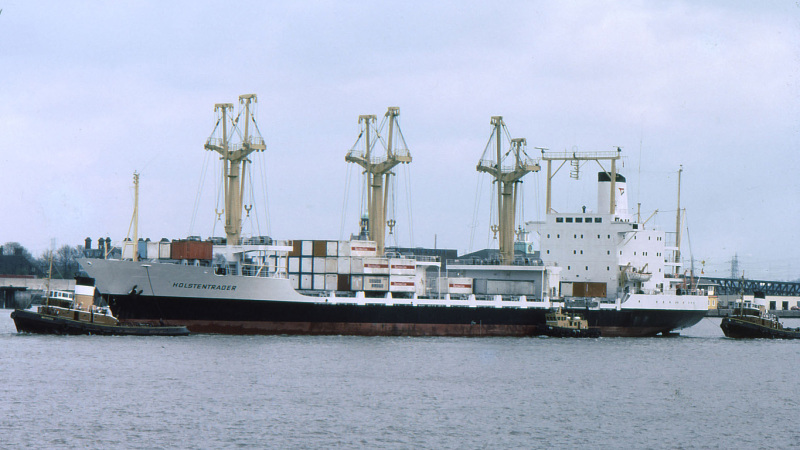 1988-sold to A/S Ivarans Rederi, Norway, renamed SAN JUAN (Norwegian flag). Photo: arriving Tilbury, Port of London on maiden voyage in December, 1978, on charter to GGM – The French Line (now CMA CGM). Completed 26.10.78 so still a fairly new vessel, possibly just completing maiden voyage.